Conservatories are proven home improvements that add value to your home so if you’re looking for something that looks great whilst also commanding a return of investment, uPVC conservatories are your answer. With a uPVC conservatory installation you’ll add plenty of space and light to your home, whilst giving yourself a fantastic access point to the back garden. 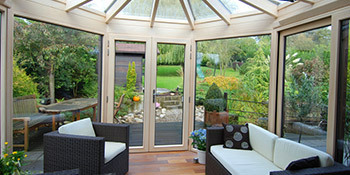 On top of this, uPVC is a top quality material recommended by conservatory installers to last for years with excellent durability and resistant qualities. Homeowners and contractors value uPVC highly for a number of reasons, which separate the material from other options such as aluminium and hardwood. Firstly uPVC is far cheaper than the two mentioned above. This has a big effect and is particularly beneficial for those on a budget. And despite the cheaper price, uPVC doesn’t skimp on quality. It’s a durable, hard-wearing and aesthetically pleasing material that’ll last well for years. Manufactured with additives and stabilisers it’ll resist the sun’s UV rays too. The maintenance is also easy, with no problems such as rotting, warping or bowing associated with uPVC. The below information illustrates the energy performance of houses in Uk. Energy ratings vary from A to G, with A being the most energy efficient and G being the least efficient. The Energy Performance Certificate (EPC) rating factors heavily when you want to sell your house, as possible buyers will see what amount they're most likely to be spending on their heating expenses. House improvements such as insulation assist to drastically increase a home's EPC rating. The information beneath indicates the different types of houses within Uk. The most common houses throughout the UK are detached and semi-detached households. Other kinds of households encompass terraced houses, flats, converted flats and bungalows. The data listed below offers an indication to the number of properties in Uk which are central heated and non-central heated. Houses are heated by a variety of sources which reflect how pricey yearly energy bills will be. Types of central heating include gas, electricity, oil, solid fuel and LPG boilers. Changing the way in which your property is heated could see you with cheaper bills. The information beneath displays the spread of households warmed by different fuels. Around the United Kingdom the most common by far are gas heated homes, followed by electricity and then oil. Biomass central heating boilers are also increasing in popularity, heated by green products like wood pellets or agricultural waste.|Homes in the UK are warmed by a variety of fuels, including gas, electricity, oil, solid fuel and LPG boilers. Each fuel has a varying cost associated with it which means you may find yourself with cheaper energy bills by switching the way your household is heated. Even solar thermal panels are being regarded as by many in order to reduce heating bills for the many years to come.